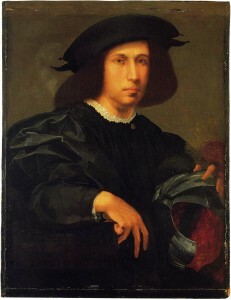 P.16 Portrait of a Man with a Helmet. Liverpool, Walker Art Gallery, no. 2804. Panel, 81.3 x 65.11 (enlarged to 88.6 x 67.3). 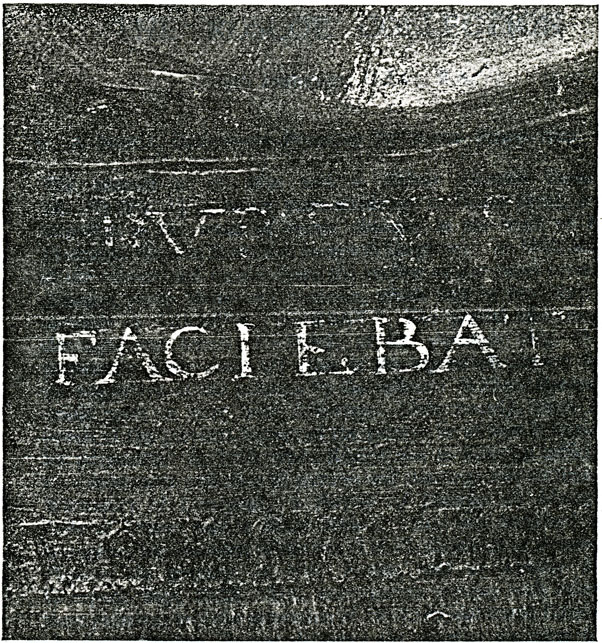 Signed beneath the sitter’s right arm: RVBEVS /FACIEBAT (the two words centered one above the other); the first word much effaced. The sitter has brown-black hair and wears a black hat. The flesh tones are very warm with pink coming through on the eyelids, cheeks, nose, wrist, and knuckles and fingers of the right hand. His garment is dark gray with a barely perceptible blue-green cast. The collar and cuff of his shirt are white. At his neck a dark olive green broach with pink highlights and a blue center. The helmet is steel blue with dark grey, drab yellow, and wine red feathers, its lining is wine red with a dark blue-gray band. The arm of the chair is black with traces of blue suggesting that it is covered with the same dark blue material that hangs from it; the tassels are also dark blue. The knob of the chair simulates gold. The background is dark olive green painted over pink lavender. PROVENANCE (from Foreign Catalogue…, 1977, 191, see below): Amsterdam, Schmidt; sold London, Christie’s, 12 June 1811, lot 29, bought by Pinney; probably bought by William Roscoe, Liverpool, Winstanley, 1811; sold Liverpool, Winstanley, Roscoe Sale, 23–26 September 1816, lot 72, bought by Crompton; passed to the Liverpool Royal Institution in 1819; deposited at the Walker Art Gallery in 1893, and presented to it in 1948. Catalogue of the… Collection of Drawings and Pictures the Property of William Roscoe Esq…, Winstanley, Liverpool, 23–28 September 1816, lot 72, as Giorgione. Waagen, 1838, III, 184, no. 22, as worthy of Giorgione. Waagen, 1854, III, 238, no. 79, as not by Giorgione but possibly by one of his less-known scholars, such as Morto da Feltre or Lorenzo Luzzo. Cavalcaselle, quoted in A Catalogue of the Paintings and Casts in the Permanent Gallery of Art, Liverpool, Royal Institution, Liverpool, 1851, 19, no. 75, and in Descriptive and Historical Catalogue of Pictures, Drawings and Casts in the Gallery of Art of the Royal Institution, Liverpool, 1859, no. 88, as belonging to the Tuscan School and by some student of Ridolfo Ghirlandaio, Sarto and Pontormo. Bernhard Berenson, North Italian Painters of the Renaissance, London and New York, 1907, 209, as Dosso Dossi. Henriette Mendelsohn, Das Werk der Dossi, Munich, 1914, 123f., as Dosso Dossi. Maurice W. Brockwell, Catalogue of the Roscoe Collection, Liverpool, 1928, 33, as Dosso Dossi. Barocchi, 1950, 253, Fig. 236 (before cleaning), after signature was revealed, dates it 1517–1521, relating it to the apostles in the Assumption and to St. John in the Villamagna altarpiece; she recognizes the influence of Dürer. Ralph Fastnedge, “Two Cleaned Pictures from the Roscoe Collection, 1, A Newly Discovered Portrait by Rosso Fiorentino,” Liverpool Libraries, Museum and Arts Committee Bulletin, I, 1951, 15–16, Fig. 2 giving a detail of the signature. Bologna and Causa, 1952, 5f., no. 5, as done a little before Rosso’s trip to Rome. Liverpool… Bulletin, October 1954, no. 27, as done between 1517 and 1521, the costume compared with that of the Portrait of a Man, dated 1517, attributed to Franciabigio, in the Liechtenstein Collection. Cleaned Pictures, exh. cat., Walker Art Gallery, Liverpool, 1955, 38–39. Baldini, in Mostra del Pontormo, 1956, 132, no. 165, Pl. CIII around 1523, and compared to the St. Catherine in the Dei Altarpiece and to Rosso’s portrait in Naples. Shearman, 1957, I, 224, II, 215, n. 7. Barocchi, 1958, 237, as done in Rosso’s Roman period, and compared with the S. Maria della Pace frescoes; she says that the helmet recalls Rosso’s collaboration with Parmigianino in via Giulia [L.18]. Keutner, 1959, 143, around 1518–1519. E. K. Waterhouse, in Italian Art and Britain, Royal Academy of Arts, London, 1960, 50, no. 101, as done before 1521. Foreign Schools Catalogue, Walker Art Gallery, Liverpool, 1963, 172, as around 1521, near to the time of the Dei Altarpiece (Plates volume, 1966, 53). Carroll, 1964 (1976), I, Bk.II, 126–127, P. 16, II, Bk. III, Fig. 27, as ca. 1522. Between Renaissance and Baroque, European Art 1520–1600, City Art Gallery, Manchester, 1965, 63, no. 200, as 1521, near to the date of the Dei Altarpiece. Borea, 1965, as from the time of the Dei Altarpiece and the Sposalizio. Freedberg, 1966, 583, as done in 1521–1524. Béguin, in EdF, 1972, 175, as 1522–1523. Foreign Catalogue, Walker Art Gallery, Liverpool, 1977, Text volume, 190–191, the most complete catalogue account of this picture, as 1518, and is closest in style to Rosso’s portrait in an English private collection [P.6]. Wilmes, 1985, 146, 152–153, Fig.33, as similar to the female saint in the Dei Altarpiece. Carroll, 1987, 71, n. 2, under no. 7, as Rosso, c. 1524, and as possibly a portrait of Carlo di Virginio Orsini, Count of Anguillara. Franklin, “Portrait,” 1989, 839, Fig.39, as Rosso. Ciardi and Mugnaini, 1991, 84, 102–103, no.18, with Color Pl., 116, seem to date the painting in Florence in the early 1520s. Mortari, 1992, 80, 99. n. 126, as influential on Salviati’s mature portraits. Franklin, 1994, 74, 212, 216, 219–222, Color Pls. 173, 175, as c. 1523 in Florence or Rome, although the poor condition hampers dating; the helmet a German type of c. 1515–1520, used in battles rather than tournaments (according to Claude Blair), the costume of conservative fashion, c. 1519–1524, because of the low-cut tunic and the gathers. Valle, 1994, 59, Fig. 17, 61, 62, as done in Florence before Rosso went to Piombino in 1518. Marchetti Letta, 1994, 77 and PL. 102, as generally dated at end of the end of the teens and the beginning of the 1520s. Natali, 2006, 130, 136–137, Figs. 92–93, with captions giving a date circa 1520. As painted for a cultured member of the Florentine aristocracy profoundly affected by republican ideals, but nevertheless still pervaded by principles of Savonarola. Also as done immediately before Rosso’s departure for Rome in 1524, its Florentine date indicated by the inscription that omits the addition of florentinus to his name that appears only on works done outside Florence. Wikipedia, 2014 (Italian), comments on Rosso’s years in Rome that some recognize the Liverpool portrait to be a portrait of the Count of Anguillara, at whose castle in Cerveteri Rosso stayed with Cellini during the summer of 1524. As the authentic signature on this portrait indicates that the picture is by Rosso, the only question that has been argued in the literature is its date. This has generally been thought to be between around 1517 and around 1523, before Rosso went to Rome. Only Barocchi, in 1958, suggested that it was done in Rosso’s Roman period, and this seems likely to me. The largeness of the image, almost too large for the size of the panel, recalling the huge figures of Adam and Eve of the Cesi Chapel in Rome, and the surety of the composition significantly exceed those of the portrait in the National Gallery in London done in 1519 (P.6). It is also compositionally a much more complex picture than the portrait of around 1520 in Washington (P.8). Comparison with the figure of St. Catherine in the Dei altarpiece of 1522 reveals, especially in the breadth of conception and in a certain passivity of expression that the figures share, points of similarity sufficiently close to indicate that the Liverpool portrait was not done before this time. But the handling of the drapery of that saint has not quite the same crispness and decorativeness of the portrait. Nor is the small patterned drapery in the Sposalizio quite the same. The closest similarity to the drapery in the portrait—to the decorative handling of the intricate and sharp folds of the sleeve—is the drapery in Rosso’s Seated Woman in a Niche in the Uffizi (D.11), done most probably in Rome in 1524 and related to the project of the decoration of the Cesi Chapel in S. Maria della Pace. In fact, the grandness of this image in the Uffizi drawing comes closer to that of the portrait than it does to the conception of any other work by Rosso, excepting the Cesi Chapel frescoes themselves. 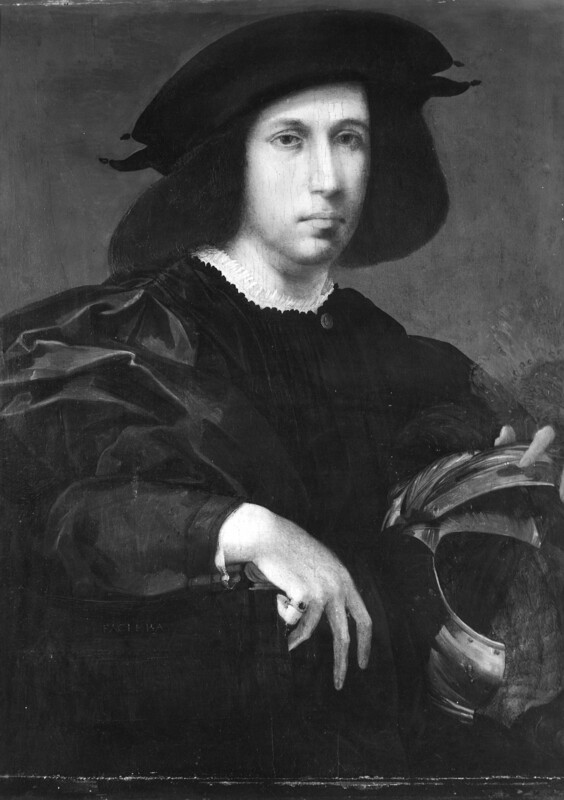 To recognize the largeness of the conception of the portrait one need only notice how much the sitter’s right sleeve and arm are cut off by the left edge of the panel, and how also only part of the helmet and only part of the left hand are included in the picture. One might also point out how the precision of the drawing of the foreshortened helmet in the portrait agrees with the immaculate clearness of the draughtsmanship of the Uffizi drawing. There may also be some similarity between the contrast of the loosely painted three plumes of the helmet seen against the sharpness of the helmet and the jaunty plumes seen above the helmet of Mars of the series of Gods in Niches (Fig.E.34). It is very probable that the portrait was done in 1524, perhaps, along with the Uffizi drawing, before the full weight of Roman art made its mark on Rosso’s art, as appears in the Cesi Chapel frescoes of the same year. It seems also to have been painted before the somewhat heavier, more sensuous, and more highly wrought Dead Christ in Boston (Fig.P.18a). 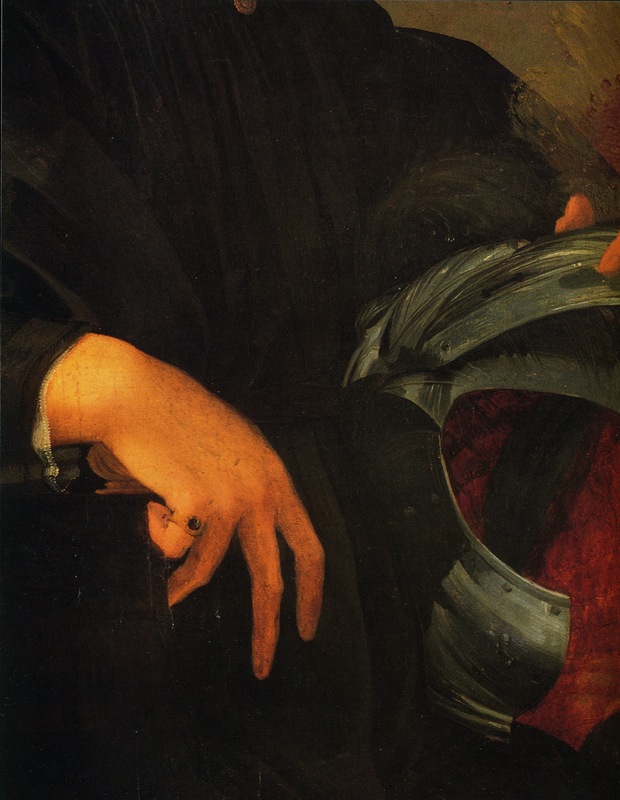 The detail of the helmet in the Liverpool portrait does not allow for any certain identification of the sitter. However, it is possible that he is the Count of Anguillara with whom, according to Cellini, Rosso stayed at Cerveteri in the summer of1524, some time after 24 June.5 This count seems to have been Carlo di Virginio Orsini.6 Rosso’s three drawings illustrating episodes from the life of St. Roch (D.13, D.14, D.15) would seem to have been made for an Orsini just at this time. COPY: Venice, Biblioteca Marciana, Cod. It. IV, 2033 (= 12274) fasc. 22, G. B. Cavalcaselle, Copy of the portrait, drawing (see above, the catalogue of the Walker Art Gallery, 1977, 131). 1 From Foreign Catalogue…, 1977, 190 (see below); Franklin, 1994, 219, caption to Color Pl. 173, 82.4 x 65.4 (87.8 x 67.5). 2 Freedberg, 1950, 108–109, 203–204, Fig. 124. 3 Freedberg, 1950, 107, 202–203, Fig. 123. 4 That the two artists knew each other in Rome is generally recognized by the influence of Rosso’s Sposalizio (Fig.P.13a), possibly through a drawing, upon Parmigianino’s scene of the same subject, engraved by Caraglio, and by the influence of Rosso’s frescoes of 1524 on a drawing by Parmigianino in the British Museum Freedberg, 1950, 65, Figs. 38–42. 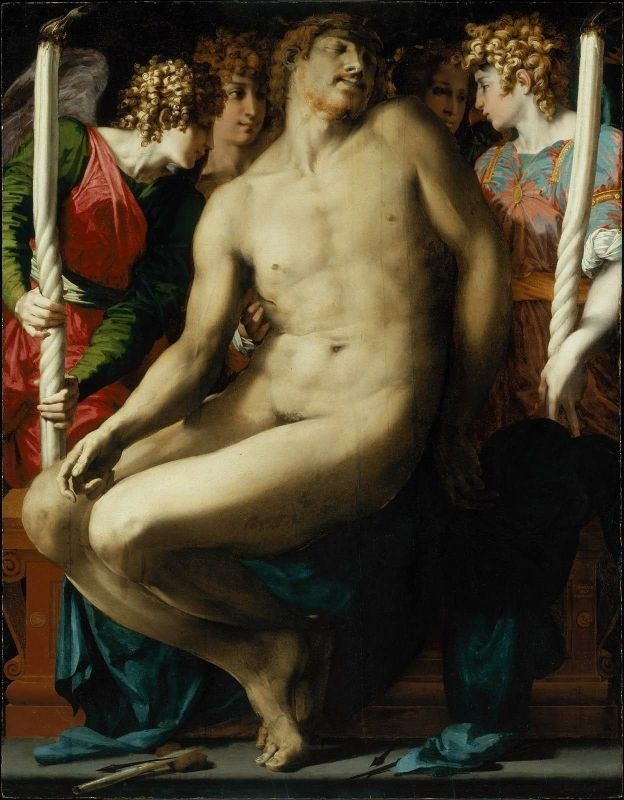 But the influence of Parmigianino on Rosso is also occasionally thought to be noticeable, as in the Cesi Chapel frescoes (see Becherucci,  1964, 457). Both artist worked for Agnolo Cesi in Rome, and did drawings that were engraved by Caraglio. It is also possible that the two artists worked together on the decorations of some rooms in a palazzo in via Giulia (L.18). 5 See Cellini-Ferrero, 1971, 293; Carroll, 1987, 70, n. 1; and Franklin, 1994, 133. 6 Gaetano Guasti, in Cellini, La Vita, Florence, 1890, 69, n. 5, would identify this count as Averso di Flaminio dell’Anguillara, but Francesco Tassi, in Le opere di Benvenuto Cellini, Florence, 1843, I, 213, n. 1, in his fuller note on the Count of Anguillara whom Cellini knew latter in France seems to indicate that the count that Rosso knew in 1524 was Carlo di Virginio Orsini. This is also indicated by Celletti, 1963, 43, 49. Briganti Colonna, 1955, 208–209, seems to indicate that his name was Carlo Gentil Virginio, and that he performed valorously at the Battle of Soriano (1497). 7 In defense of a Florentine date for the portrait, Anne Fabre and Philippe Costamagna pointed out to me years ago that the signature on the portrait makes no reference to Rosso being a Florentine, as noted also by Franklin, 1994, 219. This is the case with the signature on his Florentine works (although the Sposalizio has a second smaller signature in the book held by S. Apollonia that does specify: Rvbevs Florentino) but is unlike what appears on the signed pictures made outside Florence that all give Rosso’s full assumed name of Rosso Fiorentino, including the Roman Dead Christ in Boston that is signed: RVBEVS / FLO / FACIEBAT. This was also remarked by Ciardi, 1987. While this evidence cannot be denied there are not enough signed paintings and no signed portraits that force a conclusion based primarily on the signature alone as binding. The altarpieces in distant Volterra and formerly in the nearby village of Villamagna may have been signed with reference to Florence because those places were so far away from Florence and the artist wanted to make it clear that they were by a master from that famous city. The Boston picture was painted for a Florentine friend who was then in Borgo San Sepolcro and Rosso may have wanted that common connection of origin to me made clear. Three works of art are not enough evidence to establish a fast rule. Rosso last important paintings in Borgo Sans Sepolcro and Città di Castello are not signed at all. The style and iconography of the Liverpool portrait seem still to indicate that is was done in Rome, a dating perhaps supported by the suggestions of an architectural background recently detected and mentioned by Franklin. The fact that the inscription in the Liverpool portrait does not indicate Florence may have had it own individual reason that had nothing to do with where it was painted. In contracts made in Italy and outside Florence and written in Italian or Latin Rosso’s name generally carries with it a reference to Florence, but not the first one for the Cesi Chapel commission made with Antonio da Sangallo the Younger. In this contract in Italian the artist’s name appears as: maestro Giovanbattista alias Rosso di pittura. 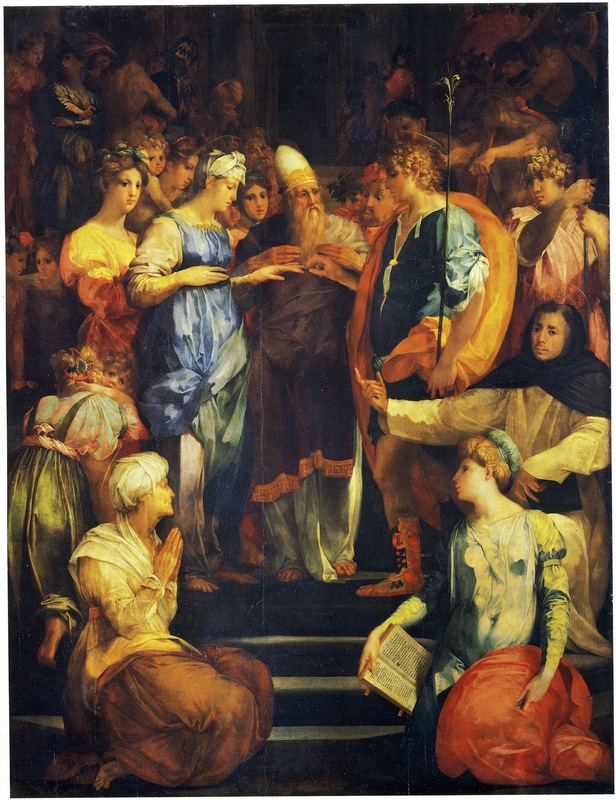 Only the Latin contract for the painting in Città di Castello gives Rosso’s name as the signature on his letter to Michelangelo: Rosso fiorentino.